The City Reliquary proudly presents, in partnership with the New York Chapter of the SS United States Conservancy, The United States: Yesterday, Today and Tomorrow. This exhibition celebrates the extraordinary career of the luxury liner known as “America’s Flagship” and her relationship with the City of New York. The show will run from June 29th to September 24, 2017. 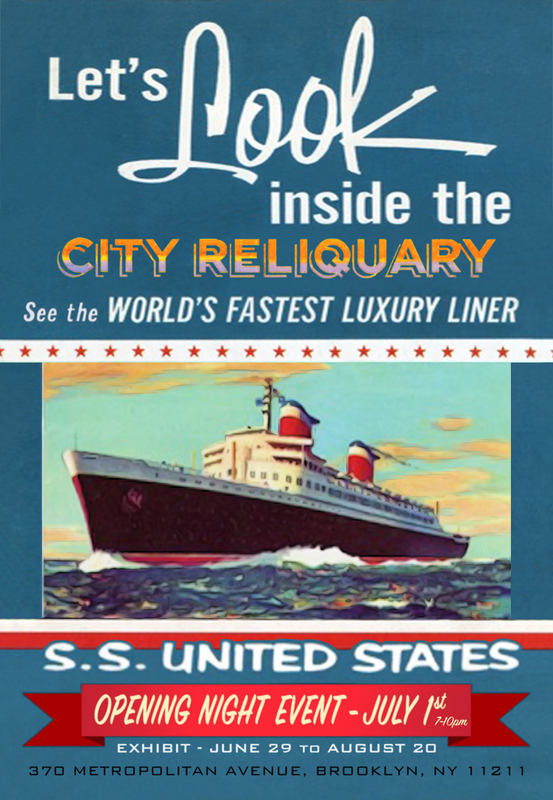 The opening event at The City Reliquary on Saturday, July 1 at 7 PM will commemorate the 65th Anniversary of SS United States’ famous record-breaking Maiden Voyage. There will be an 8 PM screening of the film Colossus On The River (1965; Runtime: 15 min.). Beverages available by suggested donation, with beer courtesy of The Brooklyn Brewery and a specialty cocktail courtesy of Montauk Rum. This show will trace the life of the ship, from young speed queen and popular cover girl to aging star of yesteryear and nearly forgotten “has-been,” and finally–with your help–to one of the great comeback stories in U.S. history. Upon its completion in 1952, the SS United States immediately won the Blue Riband for setting a new Transatlantic speed record–a record that remains unbeaten. In her heyday, the ship welcomed celebrities from the golden age of Hollywood, such as Marilyn Monroe, Judy Garland, Mahalia Jackson, Salvador Dalí, Grace Kelly, and Joan Crawford. During the 1964 New York World’s Fair, it was touted as the fastest and most luxurious way to travel to Europe. With the advent of jet technology, however, overseas travel began to look less exciting and became less profitable. In 1969, the SS United was abruptly withdrawn from service while docked in Newport News, Virginia for annual maintenance. She was moved to South Philadelphia in 1996 where she remains today. 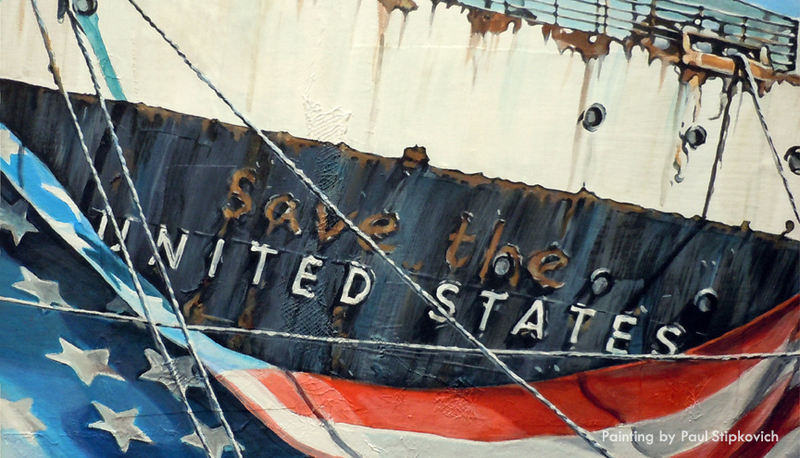 The SS United States Conservancy purchased the ship outright in February 2011. They hope to find a new purpose for the fastest, finest, and largest ocean liner ever to be built in the United States.